San Francisco, CA, November 6, 2018 – VIZ Media, LLC (VIZ Media), a premier company in the fields of publishing, animation distribution, and global entertainment licensing, announces the release of the new romantic comedy WE NEVER LEARN on December 4th. WE NEVER LEARN is by creator Taishi Tsutsui and is currently serialized in the world’s most popular manga magazine, WEEKLY SHONEN JUMP. The series is rated ‘T+’ for Older Teens and will now be published in print and digital editions under VIZ Media’s Shonen Jump imprint. 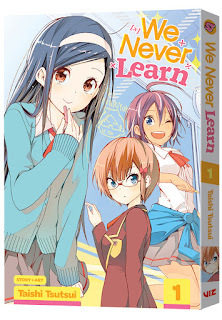 WE NEVER LEARN will carry a print MSRP of $9.99 U.S. / $12.99 CAN. The series also launches digitally on December 4th for $6.99 via viz.com and the VIZ Manga App, as well as from the Nook, Kobo, Kindle, iBooks, comiXology, and Google Play stores. Future volumes of WE NEVER LEARN will be published by VIZ Media bimonthly. In WE NEVER LEARN, Nariyuki Yuiga comes from an impoverished family, so he’s eager to secure a full scholarship to college before he graduates high school. His principal agrees, with one stipulation—he must tutor the two smartest girls at school and make sure they get into their target colleges! Taishi Tsutsui has worked on many series as a professional, including Magical Pâtissière Kosaki-chan! !, a spin-off of Naoshi Komi’s hit romantic comedy NISEKOI. WE NEVER LEARN began serialization in Weekly Shonen Jump in 2017.